The stores this week are a vivid display of Amazon’s ambitions to turn Whole Foods into a place to recruit and cater to members of its $119-a-year Prime program. While Amazon.com Inc struggled to keep its site online for the start of Prime Day, the company’s Whole Foods stores relied on old-school promotional techniques to sell Prime subscriptions. Employees set up kiosks to hand out Amazon-branded temporary tattoos, Prime Day stickers and leaflets promoting an Amazon credit card. Big banners and bright decals on doorways advertised all the savings available for members. The stores this week are a vivid display of Amazon’s ambitions to turn Whole Foods into a place to recruit and cater to members of its $119-a-year Prime program. Machines at checkout let customers scan a QR code using the Whole Foods mobile app connected to their Prime accounts for discounts. Amazon Visa cardholders get 5 per cent cash back—or 10 per cent until Tuesday, as noted on signs and pamphlets at stores, in celebration of Prime Day. The credit card requires a Prime membership to get the savings, and a Whole Foods cashier in San Francisco eagerly offered to walk a reporter through the process of signing up from her phone. Annual memberships are an important source of revenue for Amazon and a way to keep people engaged with its many businesses. It offers shipping discounts for online shoppers, a video-streaming service to rival Netflix Inc and a variety of other perks, including digital photo storage. 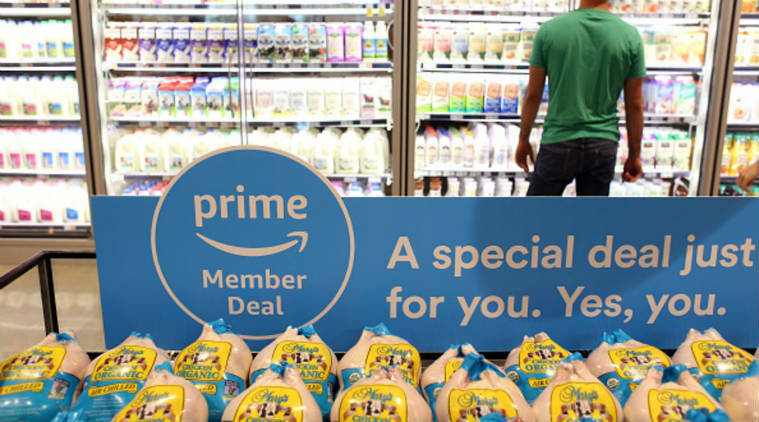 About 60 million US households have Prime memberships, said market research firm Cowen & Co Prime members in the US spend an average of $1,400 a year on Amazon, compared with $600 for non-Prime members, according to Consumer Intelligence Research Partners. Whole Foods locations present a new opportunity for Amazon to captivate these shoppers. Amazon purchased the upscale organic grocery chain for $13.7 billion last year and has been lowering prices and slowly trying to shed the chain’s “whole paycheck” image. This year, Whole Foods pushed its Prime membership by giving further discounts on items like granola and dried fruit, and offering free home delivery through the Prime Now app.